According to a study by Emory University, doctors live an average of five years longer than the rest of us. They know what it takes to keep themselves healthy—and this book shows you how to think and act like one of them. 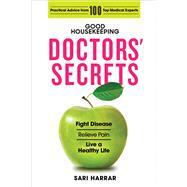 Award-winning journalist Sari Harrar checks in with more than 100 top medical practitioners to learn their science-based daily strategies . . . and puts them right at your fingertips. Find out what experts in everything from gastroenterology, endocrinology, and dermatology to sleep medicine, nutrition, obstetrics, and surgery do, from treating emergencies quickly and getting the right tests to taking supplements and becoming smart healthcare consumers. See how they stay slim (even enjoying dessert), what they think about juice cleanses, which foods they feel fight disease, how they double a nap’s energy rewards, what they do to beat colds and flu, why they mix regular and alternative medicine, and so much more. Fun and useful self-diagnostic tests begin each chapter, and the information is beautifully organized for easy use. Sari Harrar is an award-winning freelance journalist specializing in health, medicine, and science. The former Health News editor for Prevention magazine, her writing appears in bestselling health books, online, and in national magazines including O—Oprah magazine, Dr. Oz The Good Life, Good Housekeeping, Consumer Reports on Health, and Reader’s Digest. She was the recipient of a CASE/Harvard Medical School Journalism Fellowship and the founding writer for the Philadelphia Inquirer’s Kids’ Health blog.